There is a prevalent notion among religious and spiritual seekers that meditation on the Formless God is the higher or more advanced form of spiritual practice and the worship of forms belongs to the lower type of seekers. Let us examine how far and to what extent it is true. The approach of the worshipper of the Formless is more or less the same as that of the rational reformer, but his argument is from a different perspective. The highest Divinity, argues the seeker of the Nirakar, is formless and impersonal and all names and forms and the personal gods of worship are inferior manifestations of the formless and impersonal divine. So all attachment to the physical and vital forms of religion ties the religious seeker to the lower levels of religion or divinity and prevents him from raising to the higher formless and impersonal contemplation of the Divine. Another defect of these outer forms of religion is that they tend to become a mechanical routine of custom and tradition with no true inner life. So the seeker of the formless tends to dismiss the outer forms of religion as unnecessary or looks down upon them with a patronizing tolerance as belonging to the inferior category of worshippers. Here again we have to admit that an excessive attachment to the outer forms, symbols, and the personal gods may prevent the realisation of a deeper, inner and more impersonal and formless aspect of the divinity. But this is not a sufficient reason for altogether discarding these outer forms. 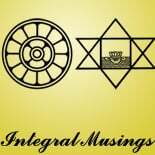 There are two major flaws in the argument of the seeker of the formless. First of all, the form and personal aspect of God is not necessarily inferior to the formless and impersonal aspect of God. The integral experience of great spiritual Masters like Ramakrishna and Sri Aurobindo reveal that form and formless, and the personal and impersonal are equal manifestations of an ultimate Reality which is beyond form and formless, personal and impersonal. So we can reach this Absolute either through the formless impersonal or the forms of the personal Divine. “In any cult, the symbol, the significant rite or expressive figure is not only a moving and enriching aesthetic element, but a physical means by which the human being begins to make outwardly definite the emotion and aspiration of his heart, to confirm it and to dynamise it. For if without a spiritual aspiration worship is meaningless and vain, yet the aspiration also without the act and the form is disembodied and for life, an incompletely effective power. Even after we are in direct and constant inner contact with the divinity these outer forms can still remain as the outer expression of an inner realisation. Thus outer forms of worship can continue even after inner realisation of the divine, but now illumined and enlivened by the divine presence. Therefore “idolatory” is not in the outer act but in the inner condition of the worshipper. For example someone like Ramakrishna Paramahamsa who worshiped many idols is not an idolator because he did not worship the outer idol but the living divine Presence in the idol, which he was able to see and feel. On the other hand someone who worships or meditates on the idea of the formless God but who didn’t have the inner experience of the formless, is an idolator because he was worshipping only the mental idol of the formless and not the living truth or presence of the formless. We need not be ashamed of our idolatry. As we have said, until the divinity we worship becomes a constant living presence, we need some inner or outer idols for our progress in the path of religion. So outer forms of religion when used with the right inner attitude can help in our spiritual development. But still we have to admit that in the average religious mind, the outer forms of religion tend to externalize and mechanize the consciousness and turn the religious life into a repetitive and mechanical routine devoid of the inner life. The remedy to this problem lies not in eliminating the outer forms but to constantly reenergize and renovate them by the light and life of the spirit. At a certain stage in the evolution of religions, there arises a need for new forms, like for example new symbols, which are in harmony with the changed inner condition and needs of the community. A matured religious system is sensitive to this need for change and responds creatively to it. We can find a classic example in the evolution of Indian mythology. The symbols and legends of Vedic mythology had taken totally new forms with entirely new significances in the later mythologies evolved during the Gupta age. The most remarkable feature of this change is that it was not done by a few individual creators but by a collective religious intuition, given the name “Vyasa”, who is not a single person but the name used by innumerable creators, as a sign of respect and faithfullness to a much revered Rishi in the Indian tradition, who was probably the original spiritual inspiration behind the work. This constant renewal and change is indispensable to get the support of the vital force. For our vital force needs constant change and novelty to keep it interested and enthusiastic. One of the reasons for the mechanization of the outer forms and discipline is due to this loss of support of the vital energy which gets bored and loses interest in the ideal, form, act or the discipline. But change of form is not the only way for engaging the vital energy. For example, there are some tantric rituals of worship in which a conscious attempt is made to dynamise the entire act with the vital force of the worshipper through a combination of breathing technique and appropriate gestures. But in religion, only the spiritual force can bring about a true and lasting renewal. In the religious and spiritual education of the masses it has to be emphasized that the outer forms are only a means to the inner awakening of the divinity within and this inner awakening depends not merely on the scrupulousness of the outer act but on the understanding of their inner significance and the quality of the inner attitude. So the primary emphasis has to be on the inner spiritual aspiration, adoration, experience and realization and the outer form exists only as a means and support for kindling or expressing this inner flame. of my previous room mate! He consistently kept talking about this. I will forward this post to him. Pretty confident he will have a good read. is simply excellent ɑnd i can assume you’re an expert οn this subject. post. Thanks ɑ million and pleaѕe kеep up the enjoyable wоrk. This entry was posted on April 18, 2012 by integralmusings in Religion, Spirituality & Philosophy.